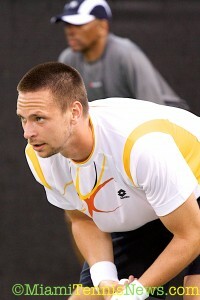 Robin Soderling thrives playing indoors. Six out of his eight previous titles have been in that setting. After defending in Rotterdam last week, Soderling grabbed his second straight title by beating Marin Cilic 6-7,6-3,6-3 at the Open 13. With that, Soderling bagged his third title of the season. By netting a forehand, Soderling gave Cilic a break point to open the first set. With a forehand crosscourt pass for a winner, Cilic converted. Next, at game point, Cilic threw in an ace for a 2-0 lead. Soderling finally got back on track with a quick hold. Cilic continued to have comfortable games, however, so did his opponent. Yet, serving at 4-3, Cilic could not find his first serve and was made to pay. In provoking another backhand error from Cilic, Soderling obtained double break point. When Cilic’s forehand up the line misfired, the players were locked at 4 all. With a prompt hold, Soderling edged in front for the first time at 5-4. At 5-6, Cilic guarded serve without difficulty to force a tiebreaker. With a sensational stab at a booming serve, Cilic forced a backhand miscue from Soderling to secure a mini-break at 5-3. After Soderling failed on a crosscourt pass, Cilic was at 6-4. However, Soderling managed to wipe out both set points. Later, when Soderling’s backhand down the line landed long, Cilic had his fifth set point. As a result of Soderling’s return going long, Cilic finally had the set. Following a love game to start the second set, at 1 all, Cilic sent a forehand out of play to hand Soderling his second break opportunity of the game. Soderling banked the break when Cilic dumped a backhand into the net. 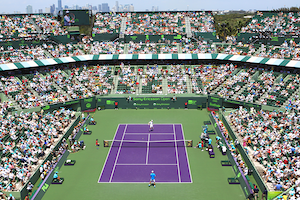 Subsequent to consolidating with a love hold for 3-1, his next time up, Soderling committed three successive errors to gift Cilic triple break point. As Soderling’s backhand crosscourt sailed long, the players were knotted at 3 all. Yet, after having multiple game points, Cilic produced an unforced mistake to give Soderling a break chance. By anticipating Cilic’s shot, Soderling struck a forehand pass up the line winner to regain the lead at 4-3. Soderling solidified the break by holding, then broke again at love to push the championship into a final set. Subsequent to a prompt service game, Soderling got to break point after Cilic’s forehand found the net. Still, Cilic was able to prevail in that game. For the next three games, each player cruised. But, in the sixth game, Cilic began with a double fault. Later on, Soderling thumped a backhand down the line pass for a winner and arrived at triple break point. When Cilic flubbed another backhand, Soderling had the break for 4-2. Once again with a fast hold, Soderling got to 5-2. Although Cilic held, Soderling serve was impenetrable. With Cilic bouncing another return long, Soderling had triple match point. The Swede wrapped up the title with a forehand up the line winner. Despite being disappointed, Cilic recognized that he had a fantastic week with victories over Tomas Berdych in the quarterfinals and saving match point against Mikhail Youzhny in the semifinals. Cilic stated “I am looking forward to coming back next year”. Soderling is also grateful for the great run he has had of late saying “I am happy I won”. Soderling congratulated Cilic on his play because it was a battle particularly “the first set was really played well . . . Keep this up and you’ll have a great year”. Moreover, Soderling expressed his gratitude to those in his box who stick by him day in and day out “win or loose, you are there . . .thank you”. Thus far this year, Soderling’s only loss has been in the round of 16 at the Australian Open.